We’re milking goats now. Every day. 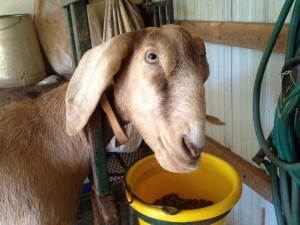 I have two old goats – they know the routine. They jump on the stand, put their head through the head gate and eat all the grain they want! But this year, I have a newbie milker. She HATES the milk stand. She HATES when you touch her teats. ….and she could care less about the grain. I’m always afraid she’ll hurt herself or hang herself. So I take charge. I am human and I can overpower her…..I think. This day, I didn’t do so well keeping it together and Lavender was exceptionally stubborn. The more she resisted getting on the stand, the more I was insistent that she WOULD get on the stand. It became a battle of wills. She locked her knees……I dragged her to the edge of the stand. She pulled back her head with all her might……. I hung on to her collar with every ounce of strength I could muster. She refused to let the front of her body get close to the stand….I tried with all my might to lift her onto the stand. Back and forth….a true battle of wills. I was sweating. Hot. Exhausted. Irritated. And she was not budging…not one bit! I smacked her backend hoping for one step forward closer to the stand….. I was saying “not so nice” things about her in my head. And my irritation and anger rose beyond her. I wanted to control her. I wanted her to do what I wanted her to do. She wasn’t buying it and fought even harder…..
Do you remember that story from pre-school about the wind and the sun? The story about the competition between them to see who could get the man on the street to take off his coat? The wind blew and blew….blew harder and harder….and the more the wind blew, the tighter the man held onto his coat and wrapped it around him. Then it was the sun’s turn. Gently….calmly…..quietly……the sun began to warm the man. He released his grip on the coat. He smiled as the sun warmed him. And then the man took off his coat to enjoy the warmth of the sun. 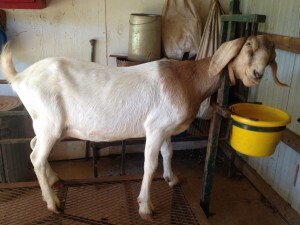 Yeah – wish I’d remembered that story when I was fighting with the goat in the milking parlor!! I was certainly the wind….a storm….a tornado!! I finally caught myself and my emotions…. and calmly walked away…. 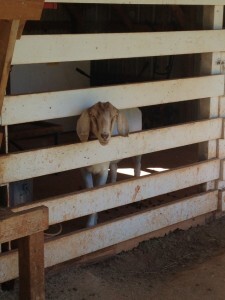 And ever so gently, I opened the parlor gate…. Yep – I’m still the human! And I realized that this human still needs to keep a watch on her temper….even when no human is looking. Animals talk you know! And word gets around…. And I love my animals and want them to know that with every touch and every word I speak to them…. What a great way to put it. Once I understood this I understood how to train a goat to the milking stand. It is a dance and we choose the moves….and they will follow our leading. Every time. It is a beautiful thing. I so enjoyed this story. Thank you so much for sharing it. Loved this story. How patiently and calm and loving God is with us.